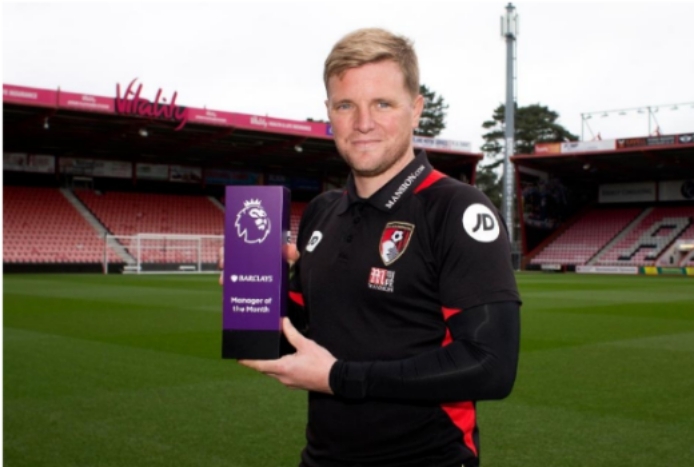 Bournemouth manager, Eddie Howe has been named as the Premier League manager of the month for October over guardiola and Sarki. Bournemouth began the month with a 2-1 victory against Crystal Palace at the Vitality Stadium before they enjoyed convincing away league wins against Watford and Fulham, either side of a 0-0 draw against Southampton. Eddie Howe and assistant manager Jason Tindall (left) have enjoyed a fine start to the Premier League season Howe, who has received the award in each of the last two seasons, has led the club to their best start to a Premier League season, since promotion in 2015. “Very proud. We know how difficult it is at this level to consistently get positive results. The challenge you face from other teams is very strong,” Howe said. “It was a very good month for us, I thought the players were excellent in their mindset to approach games, how we saw out games when we were winning. It was very professional from everybody. A late defeat against Manchester United last weekend was Bournemouth’s first defeat in six matches in all competitions, which has included their run to the Carabao Cup quarter-finals. Bournemouth sit sixth ahead of Saturday's trip to face Newcastle Pep Guardiola and Maurizio Sarri, whose sides both remain unbeaten were beaten to the award by Eddie Howe, and Brighton boss Chris Hughton, who ended a five-match winless run to record a club-first treble of Premier League wins, all by 1-0.